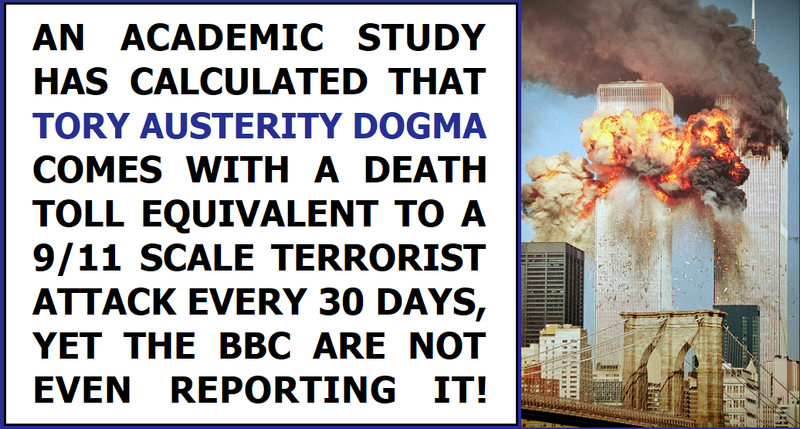 Why are the BBC ignoring the shocking death toll that comes with Tory austerity dogma? Just imagine the howls of outrage in the mainstream media if the British Medical Journal had published a study that showed that the policies of a Labour government had led to 120,000 deaths, which were described as "economic murder" by one of the study co-authors. The British Medical Journal have published such a report, but the conclusion is that the excess 120,000 deaths are the result of massive ideologically driven Tory cuts to the NHS and social care system. 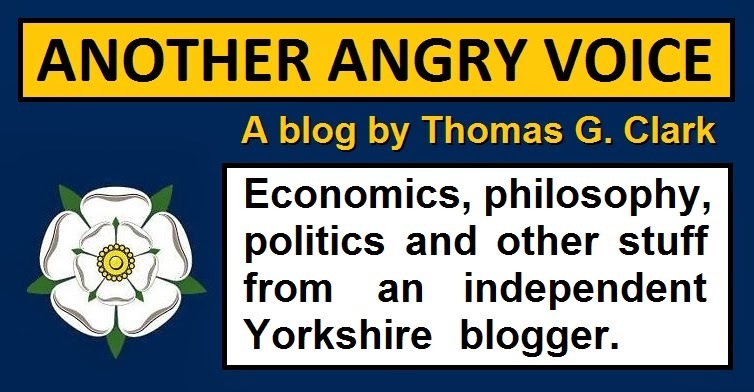 Co-author Professor Lawrence King of the Applied Health Research Unit at Cambridge University said that "it is now very clear that austerity does not promote growth or reduce deficits – it is bad economics, but good class politics". He added that the results of the study show that the Tories have overseen "a public health disaster" and claimed that "it is not an exaggeration to call it economic murder". The report also suggests that without a significant increase in health spending there could be an additional 150,000 excess deaths between 2015 and 2020. 150,000 excess deaths is an awful lot of to imagine, so to put it into perspective, this report suggests that Tory austerity dogma comes with a death toll the equivalent of a September 11th 2001 scale terrorist attack every single month for five punishing years. I'm sure Tory tribalists will find plenty of excuses for this staggering mass of excess deaths that have been linked to their fixation with hard-right economic policies. They'll weave their sick little justification narratives about how the economy is better off without the people who have died because most of the dead were economically inactive elderly and disabled people. Or they'll try to cast doubt on the findings of the study with displays of anti-intellectual sneering towards the experts who worked on it. Or they run disinformation campaigns by bombarding people with misleading statistics designed to distract people from the ideologically driven cuts to health and social care funding their party has been enacting. But the real issue isn't the sick excuses and distraction tactics spewed by the minority of Tories who find themselves cornered on the subject of the death toll that comes with Tory austerity dogma. The big issue is that swathes of the mainstream media are refusing to publicise the fact that Tory austerity dogma comes with this huge death toll. The left-leaning Independent and Daily Mirror have covered the story as well as the much maligned Russian state broadcaster RT and (somewhat surprisingly) the right-wing Daily Mail & Metro, but somehow the BBC have completely overlooked it, preferring to fixate on the growing number of sexual indecency allegations against Kevin Spacey as their headline news (as if the actions of one indecent actor somehow outweigh the avoidable loss of 120,000 lives due to Tory austerity dogma). It's easy to understand why right-wing pro-austerity news outlets like The S*n, Express, Times, and Telegraph might want to ignore an academic report that details the body count of their beloved austerity dogma, but it's quite something else that the supposedly impartial UK state broadcaster has decided to ignore a study that suggests the UK state is responsible for over a hundred thousand excess deaths, and will be responsible for a further 500+ more every week from now until 2020. So next time you hear anyone droning on about how RT is just Russian propaganda, you don't need to disagree with them, but you really should explain that the BBC runs propaganda for the UK state, and remind them of how the BBC didn't even bother to report the fact that Tory austerity has such an obscene death toll when RT actually did.